That time of the month… ladies we all know what I’m talking about. Nobody likes it but it’s something we all have to deal with. At the best, it’s an inconvenience. Aunt Flo never arrives when we’d like. You might end up with lovely PMS mood swings, bloating, and so on. At the worst, you can end up with menstrual cramps so bad that you are not leaving the house… make that your bed! The all too common approach to dealing with menstrual cramps is popping painkillers all day long. Other women even get on birth control just for easier periods. However, I like to keep things natural. Painkillers and birth control might not seem like a risk since they are so commonly used but they do have their reasons why you should avoid them unless absolutely needed. There are many ways to improve cramps from a holistic side. Before getting into my menstrual cramp relief salve, I want to go over the ways that we can help reduce cramps in the non-treatment sense. Did you know that switching to natural feminine care products like mama cloth and menstrual cups can reduce cramps?! It’s crazy but true! Drinking red raspberry leaf tea is a must for any woman if you ask me. It is a wonderful all around uterine herb and it can help relieve cramps and other period related issues like PMS. It’s best to drink red raspberry leaf tea all month long but if you have cramps then switch to my menstrual cramp relief tea. Cleaning up your diet can help with cramps. Avoiding sugar, caffeine, and estrogen mimicking foods like soy, while consuming healthy fats like coconut oil and avocado can help reduce cramps. Getting enough magnesium is said to help reduce menstrual cramps also. Most of us are deficient in magnesium so eating plenty of magnesium rich foods and applying magnesium oil is a great thing to do even if you do not suffer from cramps. I’ve also heard great things from women who take cell salts #8 during that time of the month. Exercising is something we should all do however, exercising at least a few times a week helps your body reduce cramps naturally by getting more blood to your muscles. Yoga can be especially helpful during the week of your period as you can take a more gentle approach to exercise and there are even some specific moves to help ease cramps. 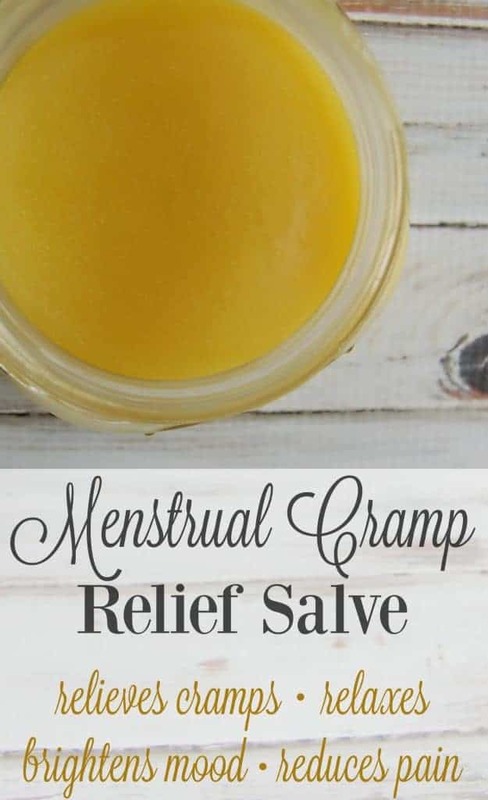 Now that we know what we can do to relief cramps in our day to day life, let’s learn how to make that menstrual cramp relief salve because sometimes no matter what you do, you still need something in the remedy section to help with those awful cramps! What Makes the Menstrual Cramp Relief Salve so Great? Arnica Oil – My recipe uses arnica oil as it’s great for aches and pains but if you are pressed for time, you can always just sub in your favorite oil such as olive oil or coconut oil. Clary Sage – This powerful smelling herb is great for regulating cycles and improving moods. Lavender – Lavender is a well known relaxing herb but it also is a pain reliever. Bergamot – During this time, we all need a mood brightener and something to pick us up out of any depression; bergamot is perfect for that job. Ginger – This spice is great at relieving pain and lessening cramps. Place arnica oil into a small saucepan and add beeswax. Heat over low until the beeswax is melted. Stir to fully incorporate. Transfer your salve mixture to a container of your choosing (I love these jars). Allow mixture to cool for 10 minutes or so and stir in the essential oils. Allow salve to cool before covering with a lid. Apply menstrual cramp relief salve to lower abdomen, back, or wherever you are experiencing cramps. Massage into the skin. Reapply as needed. Oh, man. Do I need this. I’ve been incapacitated the last few months on that first day! I just got some raspberry leaf tea. Do you recommend sipping on that throughout the month or just when needed? Now I just need to buy the stuff for this salve! Sorry for just getting back to you. Busy week here! Red raspberry leaf is best if you drink it continually. To help regulate cycles and really decrease PMS symptoms it’s recommended to drink 1-2 cups/day and it can take a couple months before it really starts working. I haven’t drank my Red Raspberry Leaf Tea since pregnancy, I have a ton left I should make a pitcher next time my moon cycle comes. I have almost all the ingredients of that salve, I have a roller ball I use currently but I would love to try that sometime. I definitely need to make this. Any help with pain I can get is awesome! Thanks for sharing at Merry Monday this week. I tried lots of natural solutions to ease menstrual cramps in the past. I wish I had known about this years ago. I am so delighted that you shared this healthy, green and natural Menstrual Cramp Relief Salve at the Healthy Happy Green Natural Party! I’m Pinning and sharing this! Love all of those essential oils. Sounds like a lovely salve. Thanks for sharing this with us at Savoring Saturdays linky party! How long does the salve keep? Also, do you think I can substitute the beeswax for coconut oil? I just made this and love it!! It’s so effective! That’s wonderful to here! So glad it’s helping! Can I purchase arnica oil and use it in place of your homemade suggestion? Yes, you can definitely buy arnica infused oil and use that instead of making your own. Do you think this would also be helpful for afterbirth pains for pregnant mamas? Yes! 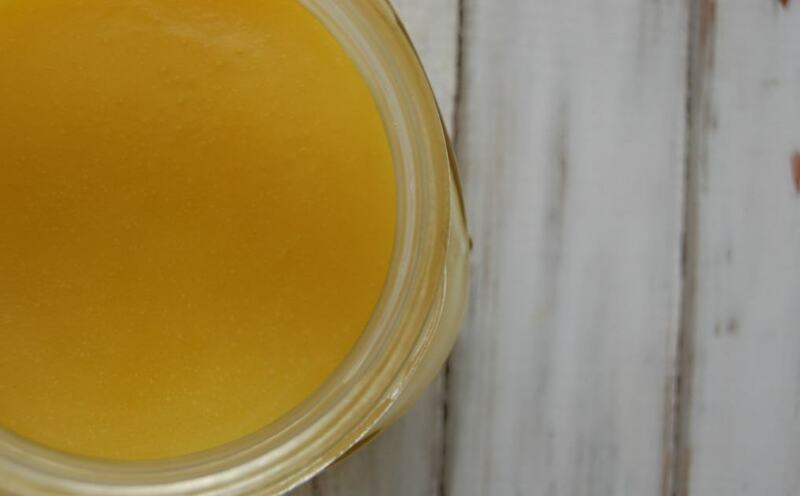 (Don’t tell… I’ve got an after pains salve on the way) but I actually created this salve specifically for my after pains with baby #5! And yes, it helps! I so didn’t know red raspberry tea helps with cramps- thanks! How can I make my own raspberry leaf tea? Is it leaves from the regular raspberry bush? Yes, it’s leaves from the raspberry bush (you’d want pesticide free leaves) but you can also just buy the leaves.